When I finished writing RULES of CIVILITY in 2010, I had no artistic impulse to follow the lives of Katey or Tinker further – feeling that everything that I should have told my readers about their lives was already in that book. But in the days that followed the completion of the novel, it was Eve who was pestering me. I kept finding myself wondering what she was doing in Hollywood. Eve was a bit of a troublemaker in New York, and something told me that she was probably causing trouble out there too. 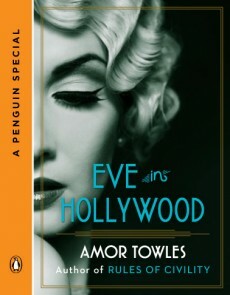 In this novella told from six perspectives, I follow Eve from the dining car of the Golden State Limited in September 1938 to the elegant rooms of the Beverly Hills Hotel, the fabled tables of Antonio’s, the amusement parks on the Santa Monica piers, the afro-Cuban dance clubs off Central Avenue, and ultimately the set of Gone with the Wind.